night to discuss raising the minimum wage. Union members gathered for a group photo in front of the council dais and chanted si se puede following the San Leandro City Council’s approval Tuesday night of an ordinance that will raise its minimum wage to $15 by 2020. A similar minimum wage ordinance was approved by the council in July that included a one-year exemption for small businesses. Upon a second reading July 19 the amendment was removed by the council to the consternation of some small business owners. Under San Leandro’s ordinance, the city’s minimum wage will rise from $10 an hour to $12 starting in July 2017 and rise $1 a year until reaching $15 in 2020. The timetable allows the city to hit $15 nearly two years before the state’s mandate of 2022. A final reading of the ordinance is scheduled for later this month. The minimum wage issue in San Leandro has engendered great passion from the public and many members of the council, but none more than Councilmember Jim Prola. For the third straight meeting involving the minimum wage ordinance, Prola gave a vigorous defense of the proposed legislation that included numerous comments he received from constituents describing their plight and inability to find suitable wages in the city. In an uncharacteristic exchange, Prola and Councilmember Benny Lee, who voted to abstain, briefly sparred. Lee maintains small businesses, especially those owned by minorities, will suffer from the minimum wage ordinance. “I hope I’m wrong, but the first ones who are going to be impacted are minorities,” said Lee. He later referenced a spate of small businesses in Oakland’s Chinatown that shuttered following that city’s wage increase two years ago. But Prola strongly disagreed. “Councilmember Lee is wrong in his facts,” Prola shot back. “He’s entitled to his opinion, but he’s not entitled to the wrong facts.” Oakland businesses, Prola countered, increased employment. “Every study shows—in San Francisco, Oakland—whenever this has taken place it has benefited businesses.” Lee then attempted a retort, but yielded after San Leandro Mayor Pauline Cutter politely advised him to relent. Throughout Tuesday’s meeting, the city’s business community registered skepticism over the ordnance. The San Leandro Chamber of Commerce said, instead, it supports the new state law signed by Gov. Jerry Brown slowly increasing the minimum wage to $15 by 2022. Numerous small business owners, clad in blue t-shirts Tuesday night, said the wage increase will unduly effect many who already struggle to keep their doors open. 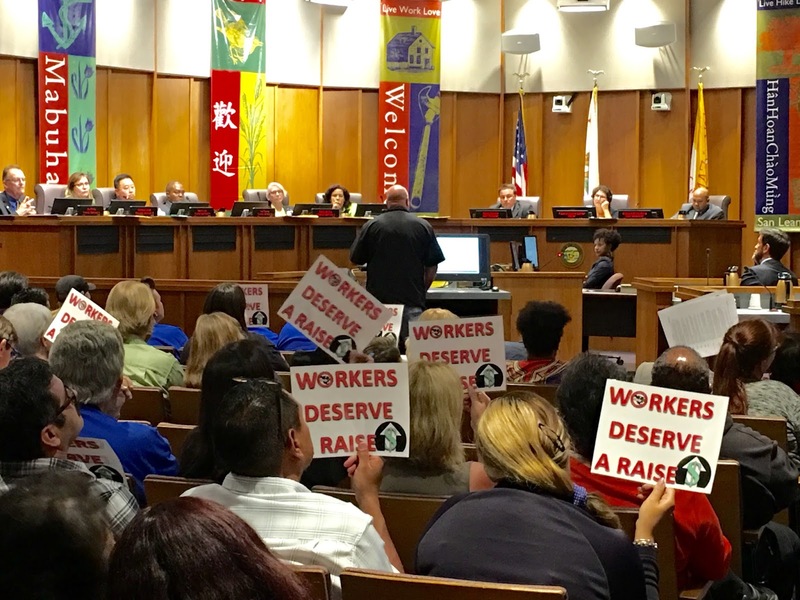 Despite the pressure from the business community, the council appeared swayed by the flood of emails and great public attention brought on by the minimum wage issue in San Leandro. Note: A correction was made to reflect Councilmember Benny Lee asbtained on the minimum wage vote. Posted in Benny Lee, Jim Prola, Lee Thomas, minimum wage, Pauline Cutter, san leandro, San Leandro Chamber of Commerce, san leandro city council. Bookmark the permalink. If they so desire, they can raise the minimum wage to fifteen dollars per hour, one hundred fifty dollars per hour, or even fifteen million dollars per hour, and it still won't mean very much if the laws are not enforced. More specifically, laws, and especially in the Bay area, are very often ignored, and sometimes even laughed at and openly flouted, and as long as the person or business breaking the law is politically connected and/or greases the palms of the politicians, and such as through election campaign contributions and/or under the table bribes, generally there is no penalty for doing so. There are tons of ways to ignore and laugh at the law, and including laws regulating minimum wage. To give just a few examples, at some businesses it is understood by all employees who do not want to be terminated that it is a job requirement to work some hours “off the clock,” and such as by coming in early and/or leaving late, but not being paid for those hours. For example, a friend of mine had a brother who was a food services manager for the contractor that provided cafeteria services to a major Ivy League university. The brother told me that it was well understood by the employees under him that their time cards and paychecks would reflect only about two thirds of the hours they worked, and meaning that if they worked for instance forty hours that week, they then would get paid for only twenty-five to thirty hours. And of course many Bay area employers largely utilize undocumented alien slave labor, and many of whom receive very little for their hours worked, and in many cases absolutely nothing at all except a threat to be turned into Immigration for deportation if they do not agree to just quietly disappear. So if I was made the czar in charge of increasing the income of low paid workers, I would concern myself much less with increasing the minimum wage and much more with: one, enforcing the laws already on the books; and two, eliminating wage theft – AND WITH MAJOR AND EXTREMELY EXPENSICE PENALTIES, AND INCLUDING POSSIBLE PRISON TERMS, FOR EMPLOYERS WHO ENGAGED IN WAGE THEFT. That extra money the workers make will go right back into San Leandro businesses, but why wait till 2020 when other cities are doing it sooner? Every working person deserves a living wage. They shouldn't have to choose between rent and food. Happy to see my city do this.